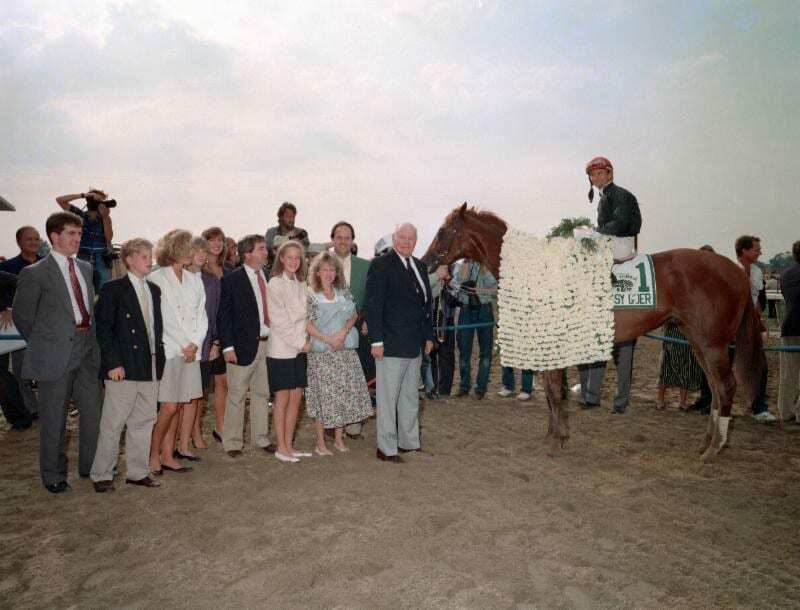 Easy Goer won the 1989 Belmont Stakes when Ogden Phipps II was just 12 years old. The second diary was from Cot Campbell, an innovator in creating racing partnerships. He remembers “the mother of all great moments” for him, when Palace Malice rebounded from a disastrous Kentucky Derby to win the Belmont in 2013. This week, the latest diary features Ogden Phipps II, a fourth-generation owner and breeder who was recently appointed to NYRA's Board of Directors. He recalls how Easy Goer turned the tables on Sunday Silence in 1989 after stinging defeats in the Kentucky Derby and Preakness. I was 12 years old when my family sent Easy Goer against Triple Crown threat Sunday Silence in the 1989 Belmont Stakes. I will never forget the excitement and optimism that filled all of us as we gathered at Belmont Park. I was so fortunate to be born into a racing family, to be able to see many of the horses we bred and raised compete at the highest level. My grandfather was 80 at the time of the Belmont, and it was obvious that Easy Goer held a special place in his heart. The son of Alydar had won the Eclipse Award as the leading 2-year-old male despite placing second to Is It True in the Breeders' Cup Juvenile when he faltered on a muddy track at Churchill Downs. We encountered yet another wet track for the Kentucky Derby and Easy Goer took second to Sunday Silence, splashing home 2 ¼ lengths back. We also knew the Preakness could easily have produced a different outcome. Pat Day, who would ride Easy Goer for all 20 starts of his career, felt he moved too soon in the Preakness. To make matters worse, Easy Goer struggled with the tighter turns at Pimlico Race Course. Then Pat Valenzuela, Sunday Silence's rider, was able to pin him inside for a ding-dong stretch duel won by a head bob. It rained heavily the day before the Belmont, but the storm gave way to a sunny June afternoon and a warm breeze. When the surface dried and was labeled fast, that only added to our feeling that everything would go as we hoped at our home track. We knew Easy Goer welcomed a return to familiar surroundings and loved everything about Belmont Park. It was as if the sweeping turns and the mile-and-a-half distance were made for him. Shug McGaughey, the trainer who has meant so much to our family's success, had been telling us for three weeks how well Easy Goer was doing. The first two legs of the Triple Crown takes a toll on many horses. Our colt was thriving on it, devouring everything in his feed tub and giving every indication in training that he was building to a peak performance for another highly-anticipated showdown with Sunday Silence. The set-up was perfect, a rivalry made for Hollywood. Arthur B. Hancock III was the majority owner of Sunday Silence. He was a long-time friend of my grandfather's, and yet each man was as competitive as could be. Sunday Silence was trained by Charlie Whittingham, then 76 years old and known as the “Bald Eagle.” There was not a more respected trainer around, and they developed a loyal following at their West Coast base. Shug was half Whittingham's age, determined to show he could match wits with his counterpart even as he tended constantly to Easy Goer's persistent foot problems. Our family has always been closely identified with New York racing, prompting an outpouring of support on the East Coast. The stable was on a roll. In 1988, we owned six individual Grade 1 winners led by Personal Ensign. She capped a remarkable 13 for 13 career with a tremendous performance to eke out a nose victory in the Breeders' Cup Distaff in her dramatic final start. Although Sunday Silence had dealt us stinging defeats in the Derby and Preakness, we thought there were legitimate explanations for those defeats. We felt good about our chances at our home course as Belmont Park filled with Easy Goer fans. When the starting gate snapped open, we anticipated that Sunday Silence would go for the lead. Instead, it was Le Voyageur, a horse from France, who shot to the front with our arch-rival stalking him in second. Day, known for his patience, typically was in no hurry with Easy Goer. He made sure to keep him outside, free of trouble, and gradually eased him into a good striking position in third. As they neared the final turn, Valenzuela prompted Sunday Silence and they began to take over the lead from Le Voyageur. Day waited a beat or two, although it seemed much longer at the time. When he finally asked Easy Goer, the response was exhilarating. He all but exploded around the last turn, blowing past Sunday Silence while Le Voyageur ran gamely in third. We waited for Sunday Silence to fight on, as he had so courageously in the Derby and Preakness. But Easy Goer was too much. On this special day, he was every bit the great horse he was born to be. Day glanced over his shoulder midway through the stretch run as his mount poured it on. Not a threat in sight. When it was over, when Easy Goer had pounded out the second-fastest Belmont in history with an eye-popping time of 2:26 and romped by eight lengths, my grandfather was a picture of contentment. After striving for decades, he owned his first classic win. What a lesson in perseverance that was for me and my five sisters. It was one we never forgot. For Shug, that Belmont represented a masterful training job. Easy Goer not only withstood the rigors of the Triple Crown but saved his best for last. At age 12, I doubt I fully appreciated the magnitude of Easy Goer's accomplishment. I do now. This entry was posted in NL List, People and tagged alydar, belmont, belmont park, belmont stakes, Easy Goer, New York Racing Association, nyra, ogden phipps II, pat day, shug mcgaughey, sunday silence, tom pedulla by Tom Pedulla. Bookmark the permalink.